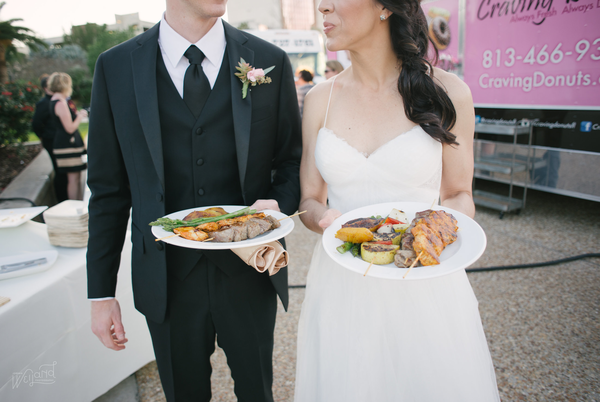 Are you thinking about using food trucks to cater your wedding, but have questions? If so, you've come to the right place! In addition to getting unique, high-quality food your guests will be sure to remember, the main advantage of using food trucks at your event is their flexibility! Unlike standard caterers, food trucks have the capacity to cater your event in many different styles. All of the trucks we work with are fully contained and self-sufficient, and they can set up almost anywhere (except maybe an island, however we have ideas that involve barges!) Once parked, these mobile kitchens can offer a variety of serving styles - from providing the full food truck experience which allows your guests to order their dinner at the truck window, or a catered buffet with tables and chafing dishes situated in front of the truck, to an even more traditional buffet style set up inside your chosen venue. This degree of flexibility also allows us to be adaptable when it comes to the unpredictable Florida weather. In short, the sky's the limit when considering how you would like us to customize and set up at your event, for a one-of-a-kind experience. 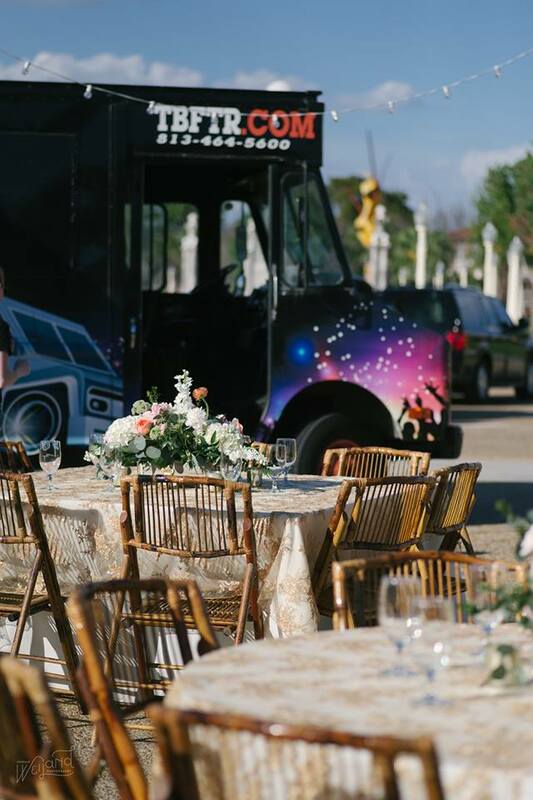 Using food trucks for catering also creates a more sociable and memorable dining experience among guests, as this unique service and setup is a first for most attendees, and encourages mingling in a way that s impractical in a standard sit-down service. 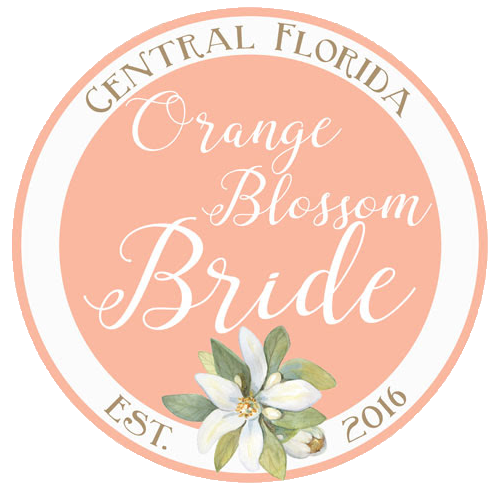 We here at Tampa Bay Food Trucks have been providing wedding food truck catering service for West and Central Florida since 2013. The cost of our services is dependent on a few factors. These include but are not limited to: the total number of guests, the number of trucks wanted/needed, the length of your event, and the amount and type of food you wish to provide to your guests. We are happy to work with you in determining the best, most cost-effective balance for your event based on the aforementioned factors. All costs will be explained and detailed up front - there are no surprises! Not only can we provide catering for your rehearsal dinner, reception and/or morning after brunch, but we can also assist with items such as dessert catering (this can also be served from a truck or on a dessert table), DJ services via our mobile DJ Truck, lighting packages, bar services and day-of wedding coordination. Our event coordination services can be as extensive as helping you through the entire process of selecting a venue, vendors, and more, or as minimal as having someone on the day of the event on site to ensure a smooth setup and service. Your day-of coordinators will handle everything from food emergencies, to unexpected weather and generator problems, to policing the trash. This service ensures that you and your family can focus on enjoying your day, rather than supervising your vendors. If all sounds great and you'd like some additional information, the next step in the process would be to verify that your chosen venue will allow food trucks on site, and pull together a budget. At that point, you'll be ready to reach out to our designated wedding team member Kim Sanders. Kim can be reached by phone at 813-390-5671 or via email at kim@tbftr.com. You may also utilize our book now form, which will prompt you to provide the details needed for Kim to provide you with further information. Thanks for stopping by, and we hope to speak with you soon!